Hello friends! Welcome to the sixth Disney fairy tale wedding dress post! This week we shall be looking at the gorgeous gowns by Alfred Angelo based off of the iconic Disney princess, Snow White! Designer Description: "Capturing Snow White's gentle grace and beauty, and inspired by nature, this net-over-satin ball gown features a lace bodice of organza apple blossoms with shimmering rhinestone and crystal centers and a skirt with scattered blossom detail. A lovely satin sash and back bow make a graceful finish." My Opinion: I think this dress is gorgeous! I really like the flowers and the and the skirt and pretty much, everything! Definitely one of my favorites so far. So beautiful. Designer Description: "This tulle ball gown with its delicately draped satin bodice pays tribute to Snow White’s gentle grace and beauty. Hidden in the skirt's pickups are lace vine motifs and romantic flowers that seem to come straight from her enchanted forest." My Opinion: To be honest.....I think this is the worst gown out of the entire collection that we've looked at so far. I think the top half of the skirt is extremely awkward and out of place. 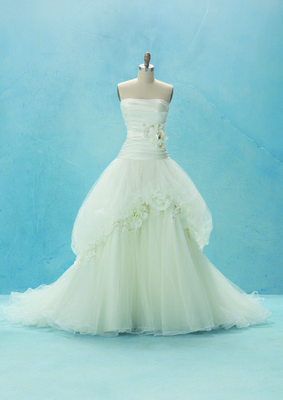 I don't know what they were trying to emulate when they made this....it looks nothing like Snow White's gown. It looks better in the model's picture, but the second one is just...I don't know. That's just my opinion. For more Disney wedding dresses and other fun updates about Disney, subscribe to The Disney Den now!